Carly Fiorina is a tested leader. She has battled breast cancer and buried a child. She started out as a secretary for a small real estate business and became a leader in technology, business and charity. 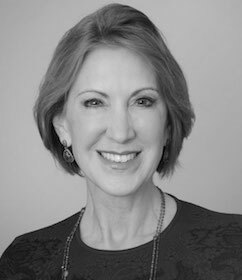 After returning to their home in Virginia with her husband Frank, Carly became a leader in the conservative movement standing alongside all Americans who refuse to settle for the way things are and a status quo that no longer works for them. She believes we must end crony capitalism by fighting the policies that allow it to flourish. She believes we must fix our festering problems by holding our bloated, inept government bureaucracy accountable. And she believes Republicans must stand for conservative principles that lift people up and recognize all Americans have the right to fulfill their God-given potential.